Star Citizen has attracted much media attention since the game was first announced back in 2012, and this is not surprising. After all, this video game is spearheaded by industry veteran Christ Roberts (who was behind the classic Wing Commander games of the 90’s amongst others), plus Star Citizen sure has become notorious in the video game world for another reason. Actually, this is the top crowdfunded game of all time, and funding is now approaching $200 million US dollars, proving that interest is high in Chris Roberts’ sci-fi video game. However, the fact that this game has been in development for so long has led some to call the project “vapourware”, saying Christ Roberts’ baby will be stuck in development hell forever and never see the light of day. Actually, despite the fact that development has been ongoing for almost six years now, Star Citizen has no release date yet. But still, it would be unfair to call it vapourware (or even a scam as some have even dared say) given that portions of the game are already playable, while the game’s alpha version recently got another update which increased the number of pilotable vehicles in the game to 70, improved frame rates and made other tweaks. Also, while Star Citizen is a multiplayer online game set in a persistent sci-fi universe, its single player mode (titled Squadron 42) is coming along nicely too. Actually, Cloud Imperium Games (the company behind Star Citizen and Squadron 42) recently released another trailer for the game, giving us an idea of what to expect from Star Citizen’s single player mode. And that’s clear is that this will be one pretty looking game judging by this latest preview – the spaceships, character models, and the vastness of space sure look great here. The story though, appears to be the typical “save the universe from an extra-terrestrial threat” setup we’ve seen countless times before in Chris Roberts’ games, especially the Wing Commander series. As in the Wing Commander games though, this has a star-studded cast. 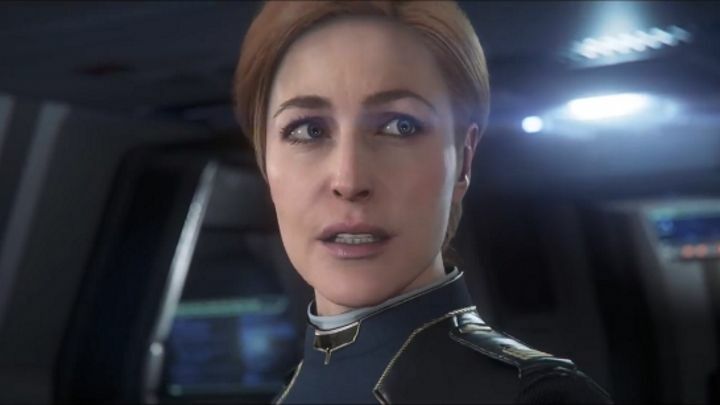 Actually, this trailer features plenty of Hollywood actors who lent their likenesses and voice to the game, including the likes of Gillian Anderson, Mark Hamill, Gary Oldman and others such as Henry Cavill. Despite this, I can’t help but notice this trailer feels rather dull – pretty-looking and packed with Hollywood talent yes, but still lacking the excitement of Chris Roberts’ earlier games. Here’s hoping though, that Squadron 42 ends up being a riveting space adventure when it’s finally released at some point in the future, and that Star Citizen gets a release date sooner rather than later too.